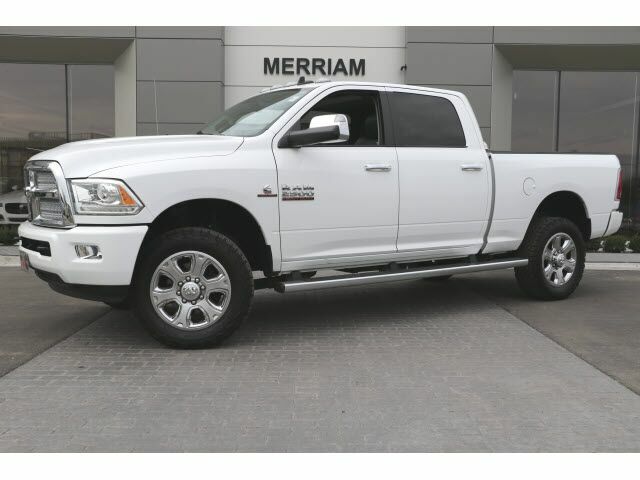 2015 RAM 2500 Longhorn Crew Cab 4x4 in Bright White over Black Premium Leather Interior. Clean 1-owner Carfax, local trade-in. Very Nicely Optioned with 6.7 Liter I6 Cummins Turbo Diesel Engine, 6 Speed Automatic 68RFE Transmission, 3.42 Rear Axle Ratio, Anti Spin Differential Rear Axle, Limited Package, Power Sunroof, Power Chrome Trailer Tow Mirrors with Power Fold Away, ParkView Back Up Camera, Remote Keyless Entry, Uconnect Navigation, Heated and Ventilated Front Seats, Heated Second Row Seats, SiriusXM Satellite Radio with traffic and Travel Link, and More! Please Contact Brian Stacy 1-855-979-0255 to Test Drive Today! Aristocrat Motors, Kansas City's premier luxury dealer strives for the highest levels of customer service. Voted "Best in Business" by the readers of Ingram's magazine, our customers are our number one priority.